The Cherokee tribe was the first to inhabit what is now the eastern and southeastern United States before most of them were forcefully moved to the Ozark Plateau. One of the tribes referred to by Native Americans as the Five Civilized Tribes, various Cherokee bands played an important role in colonial America and in United States history. The name Cherokee is an old pronunciation of Tsalagi, which is the name for the Cherokee in the Creek language. The name which the Cherokee originally used for themselves is Aniyunwiya, meaning “principal people.” The Cherokee speak an Iroquoian language and had a system of writing their own language, developed by Sequoyah. Evidence indicates that the Cherokee migrated in prehistoric times from present-day Texas or northern Mexico to the Great Lakes area. However, wars with the Iroquois and Delaware tribes, who controlled those lands, pushed the Cherokee southeast to the mountains and valleys of the southern part of the Appalachian chain. They eventually settled in modern Virginia, West Virginia, North Carolina, Tennessee, Georgia, and Alabama. The Cherokee economy, like that of other Southeast tribes, was based primarily on agriculture, growing corn, beans, squash, sunflowers and tobacco. Deer, bear, and elk were hunted with bows and arrows. Smaller game, such as raccoons, rabbits, squirrels, and turkeys, were hunted with long cane-stem blowguns that propelled wood-and-feather darts. For fishing, hooks and lines, spears, and traps were used. Wild plant foods, including roots, greens, berries and nuts were also gathered for another source of nutrition. The Cherokee women wore skirts woven from plants, while the men wore breechcloths or leggings. The men would paint their skin and decorate it with tattoos. The women would sew feathers into light capes made of netting. The Cherokee were divided into seven matrilineal clans who lived in numerous permanent villages, typically placed along rivers and streams. Cherokee families typically had two dwellings: rectangular summer houses with cane and clay walls and bark or thatch roofs, and cone-shaped winter houses with pole frames and brushwork covered by mud or clay. The Cherokee crafted pottery as well as baskets. The Spanish explorer, Hernando de Soto, first encountered them in the Appalachians in 1540. By 1715 smallpox had reduced the Cherokee population to about 11,000. During the British and French struggle for control of colonial North America, the Cherokee provided warriors in support of the British, but revolted against them in 1760 in the Cherokee War under Chief Oconostota. During the American Revolution tribal members aided Great Britain with sporadic attacks on outlying settlements, as the pioneers continually encroached upon Cherokee lands. In 1785 a number of bands negotiated a peace treaty with the United States, but Cherokee resistance continued for a decade thereafter. In 1791 a new treaty reconfirmed the earlier one; part of Cherokee territory was ceded to the United States, and the permanent rights of the tribe to the remaining territory were established. Between 1790 and 1819, several thousand of the tribe began to leave their lands, becoming known as the Chickamauga. Led by Chief Dragging Canoe, the Chickamauga made alliances with the Shawnee and engaged in raids against colonial settlements, aided by the British. John Ross was an important figure in the history of the Cherokee tribe. His father emigrated from Scotland prior to the Revolutionary War and his mother was a quarter-blood Cherokee woman. He began his public career in 1809. 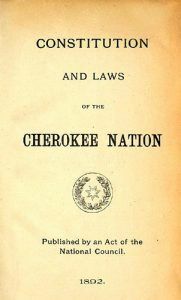 Still permitted under the Constitution at that time, the “Cherokee Nation” was founded in 1820, with elected public officials. 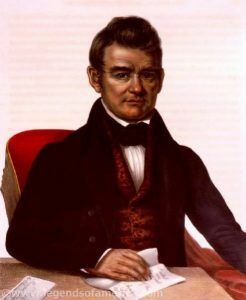 The Cherokee established a republican governmental system modeled on that of the United States, with an elected principal chief, namely John Ross, a senate, and a house of representatives. In 1827 they drafted a constitution and incorporated as the Cherokee Nation. John Ross remained the chief until his death. Meanwhile, valuable gold deposits were discovered on tribal lands in northwestern Georgia, eastern Tennessee, and southwestern North Carolina. In 1819 Georgia appealed to the U.S. government to remove the Cherokee from Georgia lands and when the appeal failed, attempts were made to purchase the territory. In retaliation, the Cherokee Nation enacted a law forbidding any such sale on punishment of death. Since the presidency of Thomas Jefferson, America’s policy had been to allow Indians to remain east of the Mississippi River as long as they became assimilated or “civilized.” This meant they were to settle in one place, farm the land, divide communal land into private property, and adopt democracy. In 1828 the Georgia legislature outlawed the Cherokee government and confiscated tribal lands. Cherokee appeals for federal protection were rejected by President Andrew Jackson. In 1830, the “Five Civilized Tribes,” which included the Chickasaw, Choctaw, Creek, Seminole, and Cherokee, were still living east of the Mississippi River. Despite the assimilation of the Cherokee, the position of the tribes was not secure. Some felt the presence of the tribes was a threat to peace and security, since many Native Americans had fought against the United States in previous wars, often armed by foreign nations such as Great Britain and Spain. Other white settlers and land speculators simply desired the land that was occupied by the tribes. Accordingly, governments of the various U.S. states desired that all tribal lands within their boundaries be placed under state jurisdiction. When Georgia moved to enforce state laws on tribal lands, the Cherokee fought them in the U.S. Supreme Court; where the court ruled that while Indian tribes were not sovereign nations, state laws had no force on tribal lands. However President Andrew Jackson defied the court’s action, when he signed into law the Indian Removal Act in 1830. The Removal Act provided for the government to negotiate removal treaties with the various tribes. The Treaty of Dancing Rabbit Creek with the Choctaw was the first such removal treaty implemented; while around 7,000 Choctaw ultimately stayed in Mississippi, about 14,000 moved along the Red River. In 1835 about 500 leading Cherokee agreed in the Treaty of New Echota to cede the tribal territory in exchange for $5,700,000 and land in the Indian Territory (now Oklahoma.) Their action was repudiated by more than nine-tenths of the tribe, and several members of the group were later assassinated. In 1838 federal troops began forcibly evicting the Cherokee. Approximately 1,000 Cherokee escaped to the North Carolina mountains, while those who lived on individually owned land (rather than tribal domains) were not subject to removal. Those who stayed behind eventually formed tribal groups including the Eastern Band Cherokee, based in North Carolina. 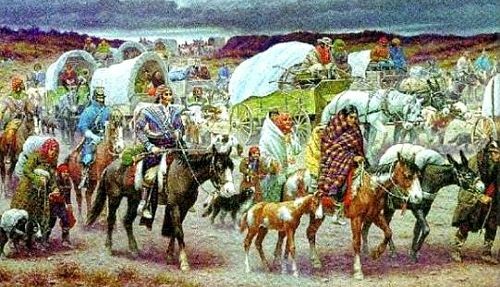 Meanwhile, most of the tribe were driven west some 800 miles in a forced march that became known as the Trail of Tears. About 4,000 perished through hunger, disease, exposure, and attacks by bandits during the journey or in stockades awaiting removal. Others died after their arrival in the IIndian Territory from disease or food shortages. So, the five tribes were resettled in the new Indian Territory in modern-day Oklahoma and parts of Kansas. The Cherokee reorganized their government under Chief John Ross, and became known as the Western Band, or the Cherokee Nation of Oklahoma. We are all human beings; but some human beings are closer to the spirit of the earth than others. It is this gentle aspect of our nature which must be preserved and protected, so that we will always know where we came from and who we are. I would love to learn more about my heritage please contact me I have many??? ?